Showcase is similar to Filter, which allows you to show or hide elements, connections, and loops based on the information they contain. But, instead of hiding your unselected data, showcase will make it translucent, fading it into the background. Showcase settings can be saved to a view, and these settings can be fully customized in two ways: through the Basic Editor, and through the Advanced Editor. Click the Settings icon on the right side of your map to open the Basic Editor. Then, click MORE OPTIONS, and select Showcase elements and connections. Click the rocketship icon to build the selection of items that you want to showcase, or type a selector into the box. In the code above, person is a selector that will showcase all elements with the element type "Person" on the map. Replace person with any selector to showcase different data. 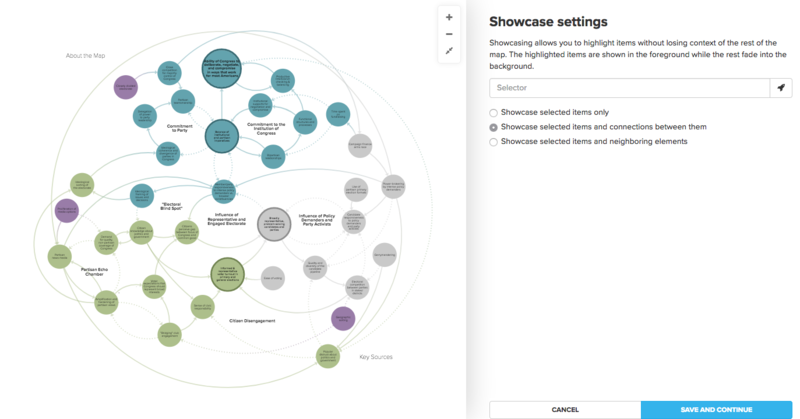 If you&apos;d like to make it easy for readers to activate showcase on their own with predefined options, check out the showcase control.